The objective of the present study was to evaluate special features of the psychological health of women with induced pregnancy and its relationship with nausea and vomiting. The Spielberger scale score results of 270 women with nausea and vomiting during of induced-pregnancy (NVIP) has been studied. The mean age of the women was 25±4.2 years. Results showed that, 31 (11,5%), 118 (43.7%) and 121 (44.8%) of pregnant women with NVIP had low, moderate and high degree of anxiety, respectively. Most of the surveyed women with NVIP (72.2%) experienced a high level of situational anxiety. For moderate and low degrees of state anxiety, the approximately equal frequency was registered, 14.1% (n=38) and 13.7% (n = 37), respectively. The state of tension and regretful from the current situation was noted by 175 (64.8%), anxiety and nervousness were registered in 158 (58.5%) and 207 (76.7%) cases, respectively. 147 (54.4%) and 187 (69.3%) women, respectively, noted their excitement for possible failures and concern. 72.2% of women with induced pregnancy have state anxiety as a result of the emotional reaction to NVIP, which indicates the need for counseling by psychologists. Yousefi M and Yousefi Z. Today, proper nutrition is one of the useful tools for the healthiness and sustainability of people's diet and especially student performance and behavior in school. 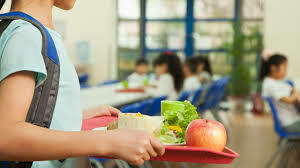 Existing nutrient standards for school meals are always important when packed foods or lunches brought from home. The aim of the present study was to determine the effects of school meals type and time on behavioral response, physical activity and the body mass index (BMI) in elementary students of Razan city, Iran. Elementary school principals (N = 16) and total of 234 students selected from 5 schools completed a survey on the school food and physical and behavioral activitıes environment. Students were weighed and measured for their body mass index (BMI) that calculated using a standard protocol and also send a BMI report card to their parents. Results of this study showed that effect of type of time regulation in school nutritional program could significantly improve behavioral response, and especially physical activity and BMI and it can be considered as an applicable strategy to the implementation of such programs on the health status of students. Banyuwangi Regency has the longest coast in East Java of Indonesia with sandy beaches and corals and there are various types of coastal and marine resources that can be utilized both in terms of economics and environment. But in the current era of industrialization, coastal areas in Banyuwangi have become a top priority for industrial development, agribusiness, agro-industry, housing, transportation, ports and tourism. 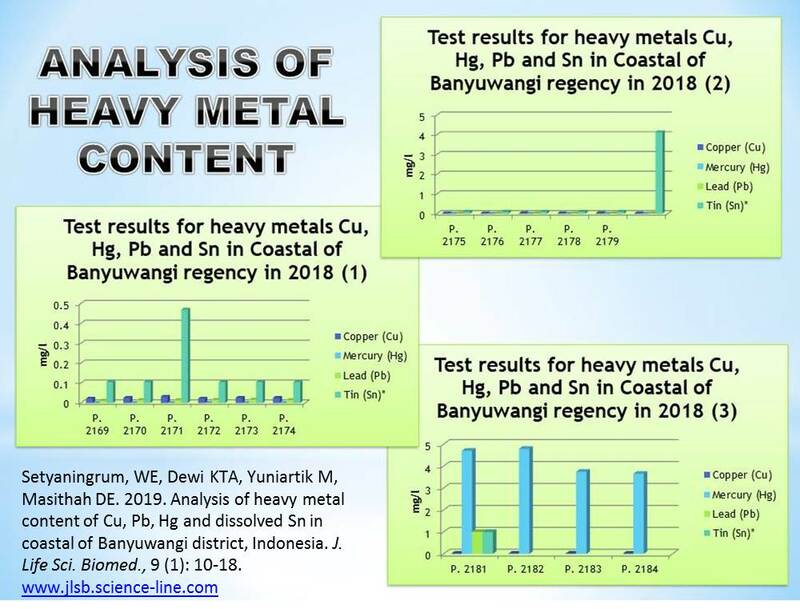 The purpose of this study was to analyze the content of copper (Cu), lead (Pb), mercury (Hg), and tin (Sn) and the effect of water quality on the heavy metal content in the coast of Banyuwangi Regency. The method in this study uses descriptive. Data taken along the coast of Banyuwangi Regency include water quality (alkalinity, NH4, PO4, DO, pH, NO3, water temperature and salinity), copper (Cu), lead (Pb), mercury (Hg), and tin (Sn). Data analysis using multiple linear regression analysis, followed by F test and t-test. The results showed that there was an influence between the quality of the water on the value of heavy metal of copper (Cu), and the value of R-Square 0.681 which means that it has an influence proportion on the value of copper (Cu) of 68.1%. Likewise, for the quality of water for tin (Sn), there is an influence with the value of R-Square of 0.700, which means that the effect is as high as 70%. While the quality of the waters against Lead, heavy metal (Pb) and mercury (Hg) has no significant effect. Based on the results of the study, Banyuwangi district government needs to take serious actions in controlling heavy metal pollution through the implementation of law No. 23 of 1997 concerning to environmental management, and the application of environmental quality standards more strictly. Aim. The aim of this study was to investigate the indexes the indexes of biocompatible pellicle hemostatic coverage in vitro and in vivo conditions. Methods. Samples of pellicle hemostatic coverage on the basis of the cellulose derivatives were used in researches. Breaking strength, estimation of the implant’s structure and adhesion power were evaluated according to the Ts 05957837-28:2014 instructions and documents of the National certification system of the Republic of Uzbekistan and with the using the apparatus "Zwick" (Germany) and atomic-power microscope of Agilent technologies (USA). Hemostatic activity of the coverage on the basis of the cellulose derivatives was estimated by the Lee and White test for the blood coagulation time. For in vivo research, 30 mature rats were required. Operations were performed under inhalation anesthesia, and the wound of liver was formed. Both macroscopic and microscopic studies had been undertaken. Morphological changes were studied in terms of 3 and 12 hours and then on the 1st, 3d, 7th, 14th and 30th day after an operation. Results. An adhesion power of the pellicle coverage on the basis of the cellulose derivatives was 7.3± 0.2 N/cm2, breaking strength was 390±4.8 kGf/cm². In presence of polymer, a coagulation time on Lee and White test was shortened by as many as 2.1 times in relation to control that made up 2.4± 0.6 min. In in vivo conditions hemostasis started during 3-5 sec. A weak inflammatory reaction of tissue was histologically determined. Further observations over dogs showed that an hour after an operation, an implant had been preserved on the surface of liver as a white pellicle and had not been separated from the wound surface. Bleeding signs were not marked. An abdominal cavity remained intact. Conclusion. Rapid enough biodegradation of polymer along with the unexpressed inflammatory reaction allows preventing the infecting related to the presence of foreign body. The rapid forming of fibrotic tissue in a zone of lesion makes it possible to obtain a durable hemostasis. A poorly expressed reaction was also marked from the side of peritoneum and surrounding organs. Recommendations. The oxidized regenerated cellulose can result in an intensive inflammation of the surrounding tissues because of the low level of pH that had not happened in the present research due to the selected correlation of ingredients of hemostatic pellicle. Keywords: Hemostasis, Morphology, Carboxymethylcellulose, Oxidized Cellulose, Hemostatic Substance. Aim. The aim of this study was to investigate current strategies in treatment of pregnant women suffering with mitral stenosis. Mitral stenosis is an obstruction of the pathway of the left ventricle flow at the mitral valve (MV) level as a result of the structural deformation of the MV apparatus, which prevents the necessary opening of the MV during the diastolic filling of the left ventricle. The most frequent lesion of valves in women with rheumatic heart disease (RHD) is MV. 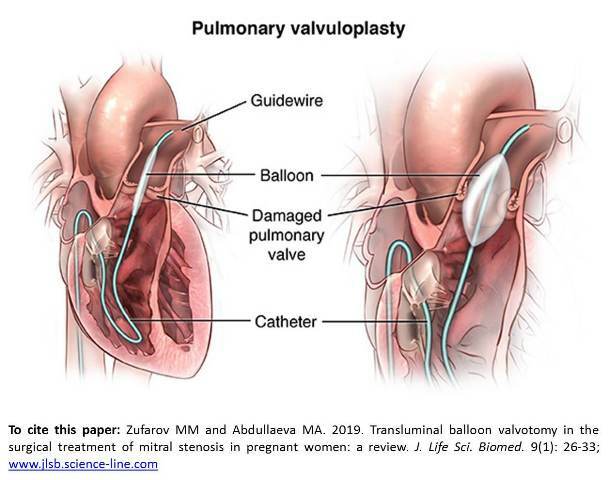 It remains the most common acquired valvular lesion in pregnant women and is one of the main causes of maternal death from cardiovascular diseases. According to the literature mitral stenosis (MS) is found in 75–90% of pregnant women with acquired heart defects. In addition, the incidence of fetal morbidity is positively correlated with the severity of MS: it increases from 14% in pregnant women with mild MS to 28% in people with moderate MS and 33% in women with severe mitral stenosis. The course of MS in pregnant women depends on the clinical manifestations, the degree of severity of heart failure, and the degree of rheumatic fever activity. Conclusion. The advantages of minimally invasive techniques during pregnancy are theoretically undeniable. The choice of the optimal method of delivery, the assessment of the fetal state of the fetus and the methods for its correction are also fundamental. Aim. 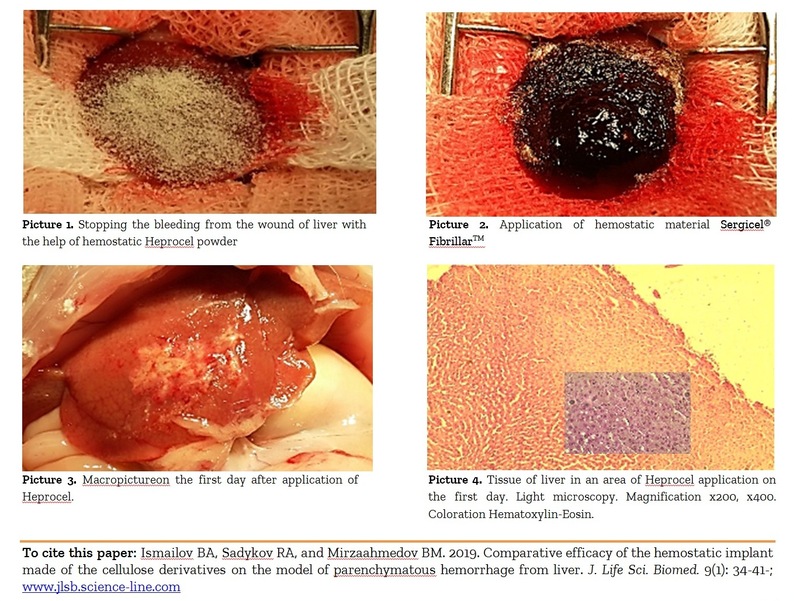 The aim was to study the comparative efficiency of the hemostatic implant made of the cellulose derivatives on a model of the parenchymatous hemorrhage from a liver. Methods. Experimental studies on the biocompatibility’s evaluation were conducted in accordance with the Russian national standard ISO 10993-6-2011. Operations have been performed under the general anaesthetizing with the modeling the parenchymatous hemorrhage from the wound of liver. A total of 72 white mature outbred rats of both sexes weighing 196.5±2.8 g were used from which 36 ones made up group of comparison using the application hemostatic material, Sergicel® FibrillarTM. In the basic group of rodents (36) powder Heprocel in equal amounts by weight of 30 mg was applied on a wound. Results. From the results it is possible to come to a conclusion that the hemostatic Heprocel implant causes on the first day morphological reaction of liver as an inflammation and a spread of the connecting tissue, but these processes calm down quickly. An inflammatory reaction was less expressed than the control group. 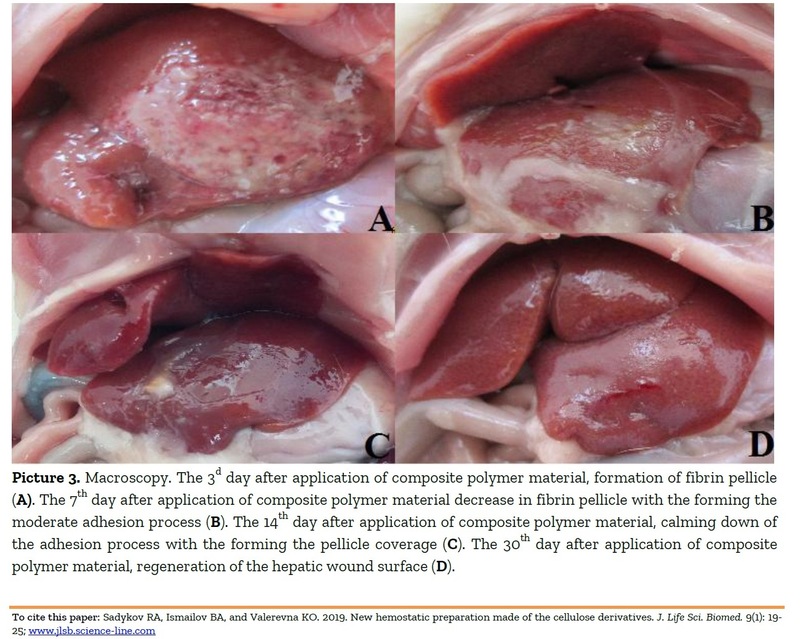 To the 30th day in the basic group after application of Heprocel biodecomposition of hemostatic implant was being marked, there were regenerator processes in the liver’s parenchima especially in the zone of lesion that testifies to renewal of liver’s tissue, while in a comparison group an active degradation of the application hemostatic material began on the 30th day and an expressed adhesion process in an abdominal cavity took place. Conclusion. Hemostatic powder closely adjoins the liver’s tissue, stops bleeding, cases of relapse of bleeding were not marked. Histological researches conducted in the dynamics of the healing showed that the wounds of liver educed that Heprocel did not cause the expressed inflammatory reaction, the zone of lesion did not exceed 150 µm, and the biodecomposition started after 14 days. Keywords: Hemostasis, Parenchymatous Hemorrhage, Liver, Cellulose’s derivatives, Experimental surgery, Hemostatic implant, Morphology of liver.